A Content Management System or CMS is a tool which is used for creating, customizing and managing information. 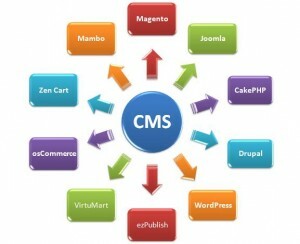 Generally, a CMS can be used alone, but you can integrate it with other applications if you want. Moreover, you can either connect the system to a local network or the internet. Though several types do exist, the primary goal of every content management system is to help you in managing information in a more efficient manner. As such, every CMS has a similar number of features, which are given below. This is a program that lets you draft, edit and publish content on your website. Content management systems like Drupal, Joomla and WordPress can help you in achieving this. CCMS is a program that allows you to manage your topic level content, which you can edit and store. Examples of such a program are XDocs, SDL LiveContent and Vasont. ECMS is a tool that can be connected to your intranet. This provides access to all the employees and helps them manage the content such as media, documents and templates. Oracle WebCenter and EMC Documentum are examples of ECMS. The Document Content Management System or DMCS is a program that allows you to store and manage PDF and Word based content. In certain instances, DMS is just regarded as an extra component or ECMS. LiveLink, SharePoint and DocPath fall in this category. As the name implies, this CMS allows users to manage content that is targeted at training. Tools like Joomla LMS and Absorb LMs can be regarded as this type. An Electronic Document and Records Management System or EDRMS is a tool that allows you to manage electronic records like the healthcare industry. WordPress is probably the most popular content management system out there. Based on PHP, it is used of blogging and widely utilized by all amateurs and novices. The program hardly takes five minutes to install, and once you do, you will not have to worry about updates; those are then care of by the program itself. Probably the best feature about WordPress is the fact that it does not require any knowledge of HTML or any other coding language from your end. For all these people, there is a simple WYSWIG editor available which is perfect for the newbies out there. WordPress primarily focuses on blogging, but with Drupal that is not so. You can use this for a number of purposes such as forums, profiles and OpenID. You can even set up a social network if you want, and if you install some third party modules, you can avail even more interesting options. Drupal has a popular feature, which is known as Taxonomy. This allows you to set multiple levels and categories for your content. Joomla is an advanced CMS that offers a lot of options. The initial options are quite easy and the program can be easily installed. However, this installation is more appropriate for shared hosting packages. Like Drupal, Joomla is also a complete content management system, but it offers more features. Examples of this included administration interface, drop down menus and other options. Joomla also provides support for access control protocols such as OpenID, LDAP and Gmail. TYPOlight is also a complete CMS that is at pretty much the same level as Drupal when it comes to functionality. However, some additional modules are offered such as calendars and newsletters. There is also a CSS generator, which saves a lot of time. Despite these benefits, TYPOlight drawback is the fact that the features are too many and so at times, it can be difficult to grasp them.